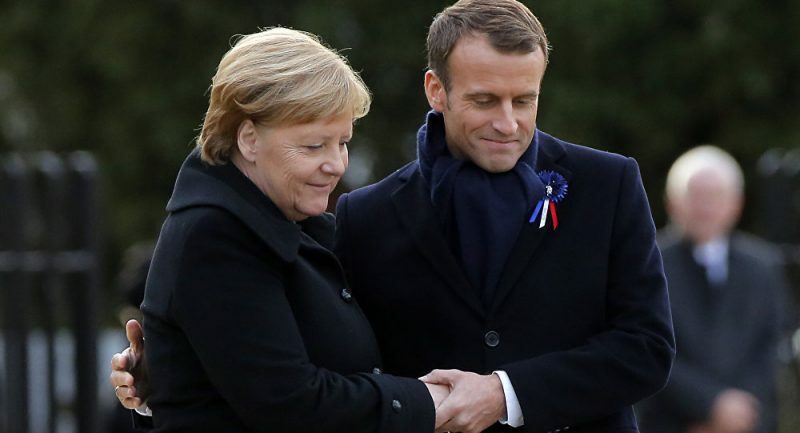 Like an old married couple, France and Germany are planning to “renew their vows” in a grandiose ceremony this month intended to confirm their role as the motor of European integration and seize back the initiative from increasingly assertive populists across the Continent. The Times The two governments said the treaty would reinforce links between their countries in areas including economic and foreign policy, education, research and climate issues and bring together areas on either side of their borders. It will undoubtedly reinforce battle lines between the German and French leaders and Europe’s right-wing populists — both inside and outside government — who are teaming up ahead of this May’s elections to the European parliament, which they intend to fight on the issue of immigration. 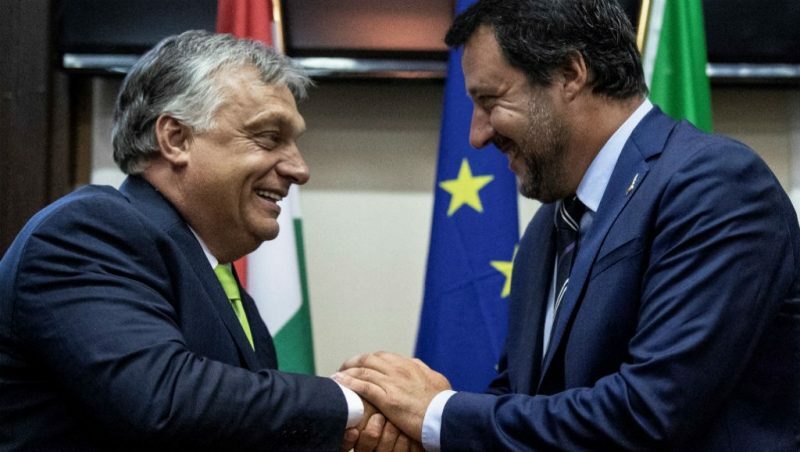 Opposition to this Franco-German axis is an alliance between Italy’s Matteo Salvini (above Right) and Hungary’s Viktor Orban (above Left), with support from other anti-Muslim migration governments including those of Poland, Austria, Czech Republic, and Slovakia. Macron LAUGHS as he betrays our French brothers and sisters. Macron will spend all eternity in HELL. The two EVIL leaders who are determined to destroy their own nations and all Europe and Britain. The monsters are determined to succeed where GOD HATER, Satanist Hitler failed. In the end, Almighty God, our Awesome Creator, wins. And will give great and everlasting victory as promised in the Bible. Their time will come and they will be hanged like ex communist Romanian dictator Nicola Ceausescu . Two captains – Macaroon the Loon and Murky – in the same sinking ship. Especially considering how many times Germany has tried to invade France in the past, they might as well now just join together in unholy Islamic matrimony. Well that history exists both ways when going back to the medieval age or Renaissance, both were striving for hegemony on the continent at given points of time. Many French profoundly dislike or even despise their neighbors but still top political executives practice cohabitation. Macron! What will Mommy (Brigitte) say? Well, we all know how well French-German relations worked out in the past… Hopefully, this time it won’t be a world war though, just a local one. But what we actually see in this pact is the capitulation of the French to the German. France came out of the last war as one of the winners, one of the permanent member of the Security Council, and one of the major powers with nuclear capabilities, whereas Germany was nowhere, had nothing. With this agreement the French no longer treats Germany as a loser, but as an equal partner. It will be interesting to see how long the honeymoon will last. Stunning, I tell ya, simply stunning! Oddly, many Germans are asking the same question, but from their perspective. Germans & French should be asking ‘why did we vote for this couple of people who want to destroy or way of life ‘ ???? Because THAT is the problem. People keep voting for these maniacs ….. ???? Mama Merkel holds Macron by the hand to baby sit him. Birds of feather flock together and their agenda will drive the ir home nations into a civil war. Hart, there is a disturbingly large number of photos in which Merkel and Macron are hugging. They are two mentally deranged people occupying powerful positions they should not hold, with Merkel the one bearing an even more evil mindset. Yes, she is. And she seems to have him on a very tight leash. Merkel & Macron … coming soon to The Comedy Channel. Is that why Pelosi was sneaking off to Belgium at taxpayer expense? To be flower girl to Merkel and her bride Macron’s EU-wedding? No doubt she had other schemes hatching in her continued resistance to Trump AND the American people. Macron has a ‘taste’ for older women so the arrangement with Muckill should be ‘right up his alley’. Ewwwwwwwwwwwwwwwwwwwwww … and I don’t mean EU. Oh come on. They’ve already caused enough problems in their nations, why is this needed? They want their people to suffer more to accelerate the Globalist agenda. and the civil war across europe is starting,much sooner then i expected,but is needed to stop the invasion and bleeding of welfare to pay for all the freeloaders. It is not a civil war. A civil war happens when two different groups of the same population in a country start to fight against each other. What will happen is a war to free Europeans from foreign barbarian invaders, mostly muslims. I think it WILL be a civil war in these Western democracies . A war between the Globalist/Islamic appeasing Left and the Traditionalists on the Right.